» review: bornpretty holo polish effect #1. » good reads. + nails of last week. » review: raw whiteout bleach kit. » never judge a pie by its ingredients. » review: sally hansen cuticle eraser + balm. review: "for rhinestones only!!" by it's so easy. great produce and great price! i'm not sure if sally's ships worldwide? i checked their website and i wasn't too sure? so i'm sorry i can't you tell about that. :/ but i'm 80% positive that that will ship to you. i wish it were clearer. but i'm sure if you search on google, a website is bound to turn up. the odor is actually pretty strong inside the bottle. smells like nail polish remover mixed with glue and nail polish. however, you can't smell anything when you apply this on your nails, which is great. no one wants so smell that! the color is actually that purple color you see, but it's clear when you pull it out with the brush and apply it, like a regular base or top coat. although not shown in this post (because i opened it weeks ago and forgot to take pictures), the packaging is actually colorful for a nail product. it's not in one of those plastic boxes. i don't know how to describe it, but it comes in a flat rectangular package with an indent for the product. (??) and it had the colorful instructions with it! the actual bottle is a cylinder container, so the top is always alined with the sides. yay! i don't know how to explain it but the best that i can do is that it's easy to hold?? like, it's actually a pretty big bottle, compared to other nail polish bottles. dries quickly, so you have to work at a fast pace. and does a fantastic job, applies smoothly. but with this product, my nail beads will last for quite a while, as i've said above. but it also depends on who hard you work your hands/nails. 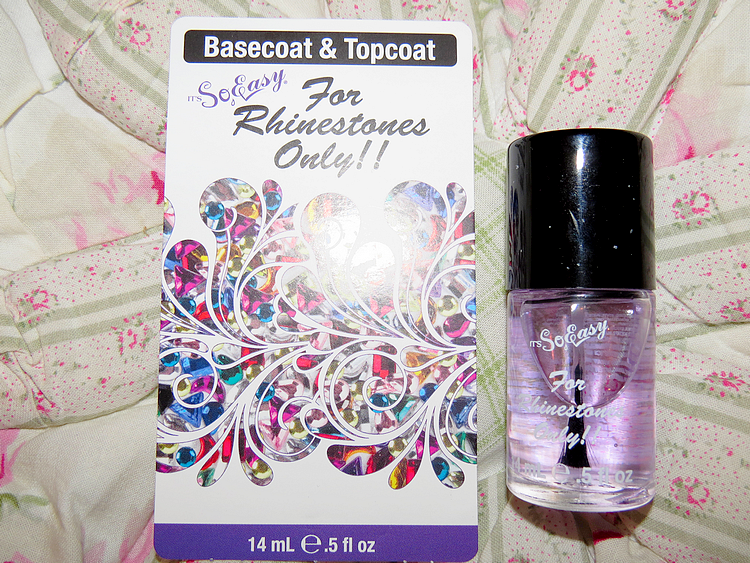 i use it as a base, apply my rhinestones, and that i add another coat of this stuff on top! i also apply a coat of my regular top coat on all of my nails. but if your rhinestone doesn't lay flat on your nail, it's obviously going to come off way quicker, so be aware of that. i would apply a little bit more of "for rhinestones only". base coat → 2 coats of polish → "for rhinestones only" → studs → "for rhinestones only" → 1 coat top coat. if interested, my nail polish is from forever21 and the studs are from bornpretty.